British black metallers Sanctus Nex are another new name to me, here in the process of releasing debut album "Aurelia" five years after formation. Featuring a fairly orthodox brand of BM, Sanctus Nex recall a slew of names such as 1349 and Funeral Mist on the bigger stage, whilst also bearing strong similarities to other more underground acts like Skaldic Curse and Israthoum in a difficult album of four songs, three of them exceeding the ten-minute mark. Opening with five-minute instrumental "Exordium Of The Apostate" Sanctus Nex show themselves to be the creators of some compositionally astute misanthropic black metal, not afraid to mix up the tempos and feels across the space of the album not a million miles from this year's surprising 1349 record. Clearly Sanctus Nex have spent time honing their songs to ensure they play with utmost passion and darkness, and for this the band deserve credit, yet it doesn't stop the overall package becoming boring at times. The opener shows this before album highlight "In Pursuit Of Albion" kicks in, but by the conclusion of "Genesis Reversion" half an hour later the feeling of having heard this all before is undeniable. 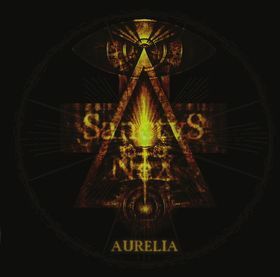 The problem is that in a world where good BM records are released with ever-increasing frequency, the need to do something that bit special becomes ever more important as time goes by and a few listens to "Aurelia" has yet to reveal that to me as the production is reminiscent of Funeral Mist (among others), the growled shrieks seemingly emanating from the bowels of hell could be one of a thousand and with long songs not travelling far enough in their time spans it's easy to argue that Sanctus Nex haven't produced the scale of record that "Aurelia" was intended to be. This is one of those records that hints at a band trying to play the game differently instead of relying upon the mediocre Darkthrone-worshipping BM template. Sanctus Nex may be receiving an average mark here but mark them as a band with further potential on album no. 2 as “Aurelia” is not a bad record at all.